Zone Base: Super Megatron, now you're playing with power... SUPER POWER!!! Super Megatron, now you're playing with power... SUPER POWER!!! I don't think about Megatron a lot. No particular reason, just don't. Guess I focus on Galvatron or other incarnations of Megatron more. That and I like a revolving cast of villains more than just one constant villain. Though, with Siege on shelves and my mind (and in my heart), I've been thinking about good old Megs quite a bit. Last week I grabbed the Siege Optimus and this past weekend Cog. This coming weekend, who knows? Maybe another deluxe or Megatron. I do like that Megatron. Though with the sci fi looks of Siege, I can't help but to pine for a Siege version of Super Megatron. Though, honestly, what I really want is an old school toy of Super Megatron (I also want to type Megatron and not accidentally capitalize the E). 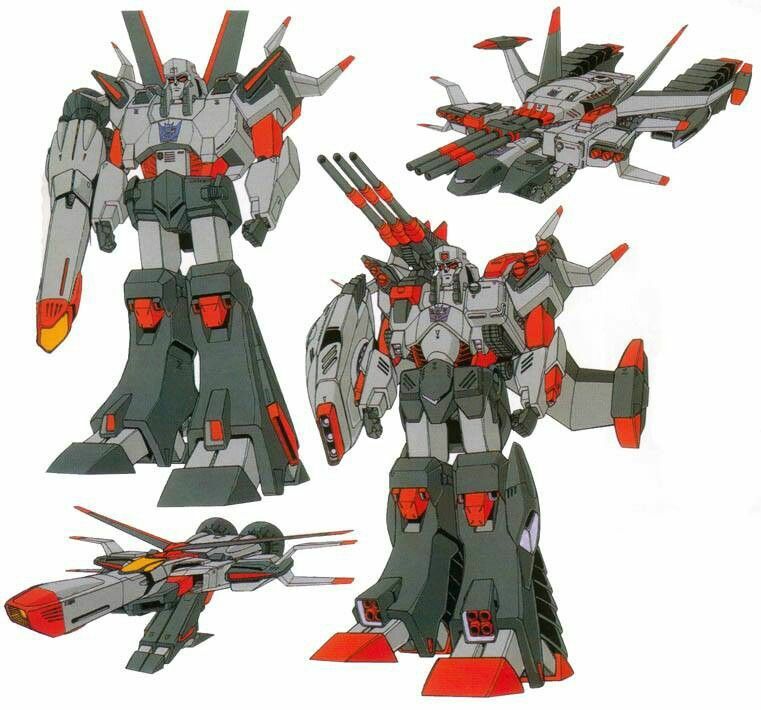 Those great classic super robot looks on a late 80's/early 90's Takara design would just be wonderful. He'd have to be pretty big too. Sky Garry sized, maybe beefier to allow for those tank parts. I've seen an older custom made from a Fighbird, and it looks pretty good, though omits the tank mode. That's understandable given the restraints of the mold. Thinking about it, the first 2 movie incarnations of Megatron are pretty similar in theory. Looking at the design, I almost expect the tank and jet parts to part form. I can easily see a drone or two made from the extra bits when not in use that would merge to form the modes. That's be a pain for someone putting together a toy from buying parts, or for those who loose stuff easily. Though that'd be my best assumption of how it would have been done. Man, the idea of buying a Korean release of this figure in one of those awesome Sonokong boxes with styrofoam... man that's the kind of thing I go nuts for.